Cabbage provides fiber, is sodium-free, fat-free and cholesterol-free. Cabbage is low in calories and contains about 5 grams of carbs per cup. 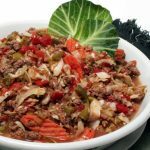 This section includes diabetic-friendly cabbage recipes and includes nutritional data for easier diabetic meal planning. 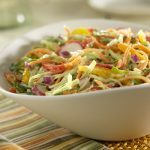 Much lighter than a classic coleslaw, this colorful salad offers tangy flavor and crunch. Enjoy as an accompaniment to grilled fish, chicken, tofu or pork. Recipe for Asian Sesame Slaw from our Side Dishes recipe section. 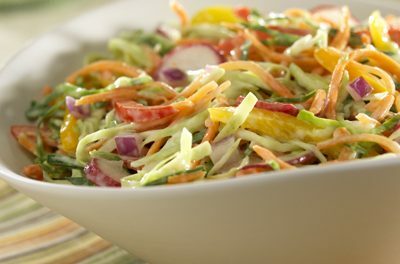 For a twist on traditional harvest slaw, omit apple cider vinegar and celery seed and replace with 2 teaspoons peanut butter and 1/4 teaspoon chili oil. Prepare as directed above. 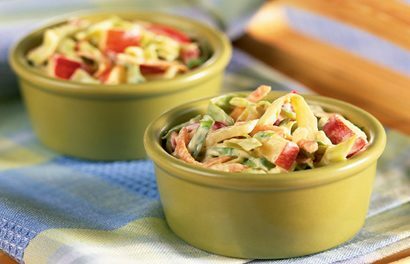 Recipe for Fall Apple Slaw from our recipe section. Serving size is 4 oz. chicken, 1 cup cabbage, and 1/4 cup snow peas. Recipe for Roasted Chicken Salad with Napa Cabbage from our Salads recipe section. Glycemic Index: 8, Glycemic Load: Less than 1 Recipe for Marinated Artichoke Coleslaw from our Side Dishes recipe section. 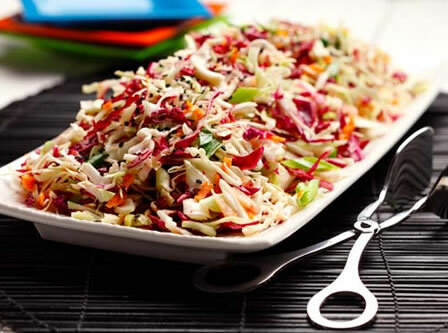 Recipe for Colorful Coleslaw from our Side Dishes recipe section. 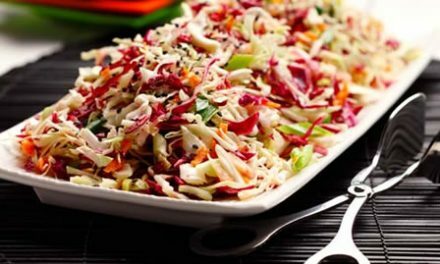 Recipe for Irish Cabbage and Potato Slaw from our Side Dishes recipe section. Recipe for St. Patrick’s Cabbage Soup from our Soups and Chowders recipe section. 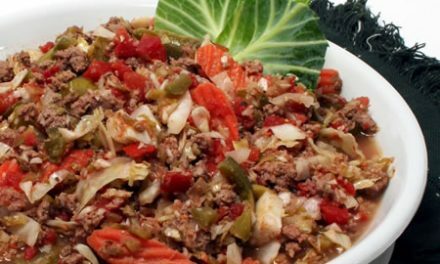 Recipe for Steamed Cabbage from our Side Dishes recipe section.